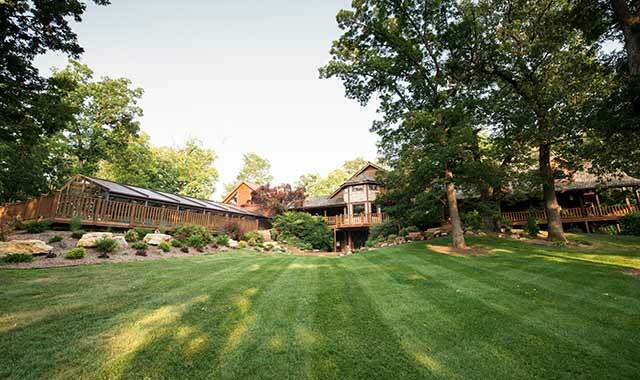 The lodge at Kilbuck Creek, in Monroe Center, Ill., began as a family home before it became a rustic retreat for families, organizations and weddings. In 1984, Chris Ames and her husband bought property in Monroe Center, Ill., a sleepy town just south of Rockford. It was here that the couple built a log cabin home and raised their six children. Ames bought out her ex-husband’s half of the home. She then teamed up with her brother, David, a builder, to turn her property into Kilbuck Creek, 6752 N. Kilbuck Road, a peaceful resort that hosts weddings, business retreats and other special events. Before she made any moves, Ames sought approval from each of her six children, who range in age from 19 to 29. Kilbuck Creek, named after the waterway that snakes through the property, is nestled into 200 acres of forest. The story goes that Native Americans used to camp on the property, searching for arrowheads and waiting to hunt buffalo that roamed along the trail. Today, the landscape is much different. The Kilbuck Lodge is an 8,500 square-foot property that has six bedrooms and plenty of space to sleep 40. There are common areas, a fireplace atrium and an entertainment room, ideal for sitting around a fire, playing pool or video games, or listening to music. The Gathering Hall is a 5,000 square-foot building with seating for 200 guests. The Hall is used for wedding receptions and other special events. There’s also an indoor pool and hot tub that’s open to guests year-round. Guests can bring in food or have meals catered. Yoga classes also are available. Every group that comes to Kilbuck has exclusive use of the property. In addition to lodging, Kilbuck offers guests 4 miles of groomed walking trails, an outdoor fire pit, and the creek, which is stocked with hungry walleye, northern pike and catfish. A majority of Kilbuck Creek’s business comes from wedding receptions, which draw clients from Chicago, DeKalb and Rockford. Last year, 15 weddings were held at Kilbuck; that number has already doubled early in 2015. The getaway also attracts busy business executives from northern Illinois and the Chicago suburbs. Kilbuck welcomes executive and church retreats, day outings and special events such as reunions, holiday gatherings, birthday parties and anniversary celebrations. All group outings must consist of a minimum of 10 guests. Kilbuck Creek is all about getting away from the hustle and bustle of everyday life. There are no televisions to be found on the property. Instead, guests swim, walk the trails, enjoy fellowship over a roaring fire or reconnect with nature and the many animals spotted around the property including eagles, beavers, whitetail deer and coyotes. The Grove Church in Poplar Grove has hosted a women’s retreat at Kilbuck Creek every fall for the past several years. Between 50 and 60 guests enjoy worship services, guest speakers, planned meals, games and activities over the course of two days. The Kilbuck Creek staff is all about family. The core staff consists of 10 employees, along with others who are hired to help with special events. Most are related to Ames, and most of her children have worked there at some point. Her sister, Carin Demus, works there, and her daughter-in-law, Branigan Theden, is the wedding coordinator. One of Ames’ daughters recently hosted her own wedding reception at Kilbuck Creek. “We all have some connection to this place,” says Ames. Saws International Cutting Consultants, a Rockford-based company, has used Kilbuck Creek for one- or two-day planning retreats. The company has 15 people who take part in their quarterly meetings, some of whom travel from out of state. After meetings are over for the day, the group chats around a fire, plays pool and enjoys some music. Ames has high hopes for Kilbuck Creek. Long-term plans include building a wedding chapel, adding smaller, individual log cabins that would sleep two to eight guests, and adding benches to the walking trails. Kilbuck also hopes to bring more youth groups to the property. Mostly, Ames just wants her guests to soak in the peaceful surroundings, much like she and her family did for many years. Despite difficult circumstances, Ames is proud of what has become of her family home. This entry was posted on Monday, May 11th, 2015 at 11:58 am	and is filed under Northwest Business Magazine. You can follow any responses to this entry through the RSS 2.0 feed. Both comments and pings are currently closed.